The Indian Equity Markets witnessed a robust short covering on Thursday as the NIFTY ended the session with a decent gain of 122.60 points or 1.22%. We had mentioned about this imminent pullback in our previous note. However, the interesting part of Thursday’s session is that despite very large number of Open Interest the rise of 122.60 points has resulted into only a minor reduction of OI. Going into trade on Friday, though we expect a quiet start, we expect the follow-through rally to continue with the levels of 100-DMA acting as important support. 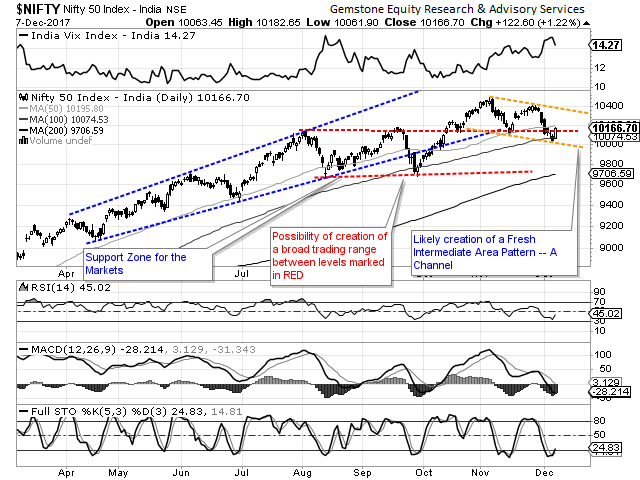 The levels of 10200 and 10265 will act as immediate resistance levels for the Markets. Supports come in at 10075 and 10020 zones. 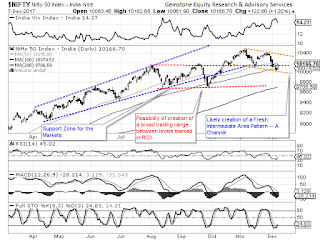 The Relative Strength Index – RSI on the Daily Chart is 45.0210 and it remains neutral while holding on and reversing from its Double Bottom support. The Daily MACD is still bearish as it trades below its signal line. A Big White candle emerged and it is significant as it has emerged near the strong support area of 100-DMA. The pattern analysis confirmed the validity of the support of 100-DMA as the Markets recovered after a minor breach and by not violating its filters. Going further from here, to the most likelihood, a fresh Intermediate Area Pattern in form of a falling channel is created and we may see the Markets behaving in this formation. All and all, the resultant formation of the Intermediate Pattern in form of a falling channel is likely to inflict lower tops in the Markets. However, as of now, we expect the pullback rally to see follow-through on Friday and expect it to continue. We continue to see stock specific performances coming out from AUTO, INFRA and Financial Services stocks. We continue to recommend making select purchases while avoiding shorts and also protecting profits at higher levels.